NEW! 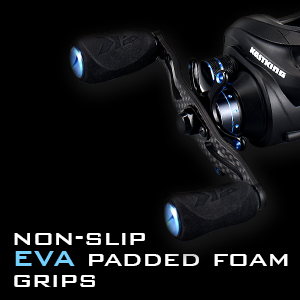 KastKing Assassin Carbon Baitcasting Reel - 5.7 OZ - 16.5LB Carbon Fiber Drag - 11+1 BB – Dual Brakes – Affordable! 1. LIGHT WEIGHT – Our lightest baitcasting reel! 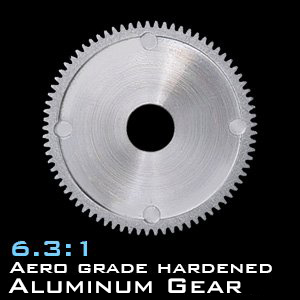 ‘Bulletproof’ carbon construction body, side plates, and handle for extreme weight savings, corrosion resistance, and added rigidity. KastKing® Assassin baitcasters only weigh 5.7 ounce (163.5 grams). Go on any fishing mission and cast all day without fatigue. 2. 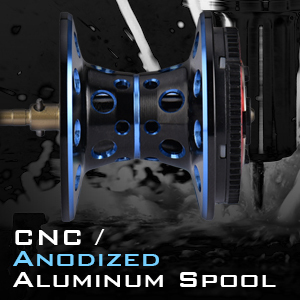 STOPPING POWER - gives you smooth, impressive 4 disc carbon fiber tournament ready 16.5 Lbs. 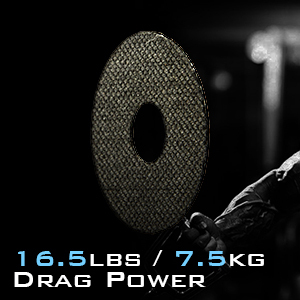 (7.5 Kg) drag that stops them dead. 3. 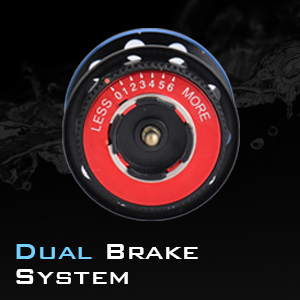 DUAL BRAKES – dynamic 6-pin centrifugal and magnetic brakes for laser focus casting accuracy, even with wind drift, lets you hit the bullseye every time. 4. 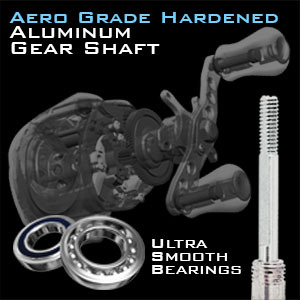 SMOOTH – 11 + 1 shielded corrosion resistant MaxiDur ball bearings, hard anodized aero-grade aluminum spool, powerful precision matched 6.3:1 ratio brass gears, instant stop anti-reverse for devastating hook sets, and braid line ready line guide insert. 5. 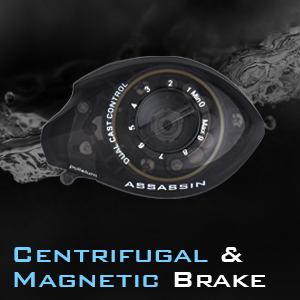 COVERT OPERATIONS - Open KastKing Assassin’s easy access side plate to reveal the Assassin baitcaster’s inner secrets, dial in your settings, call your shot, put your trophy fish in your crosshairs, hit your target, and slay. Midnight black finish. Best price and features for carbon baitcasting reels. MOOTH – 11 + 1 shielded corrosion resistant MaxiDur ball bearings, hard anodized aero-grade aluminum spool, powerful precision matched 6.3:1 ratio brass gears, instant stop anti-reverse for devastating hook sets, and braid line ready line guide insert. LIGHT WEIGHT – Our lightest baitcasting reel! 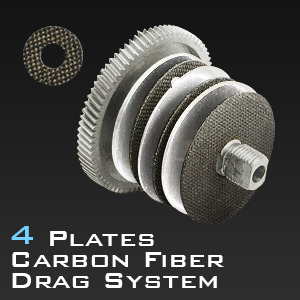 ‘Bulletproof’ carbon construction body, side plates, and handle for extreme weight savings, corrosion resistance, and added rigidity. KastKing Assassin baitcasters only weigh 5.7 ounce (163.5 grams). Go on any fishing mission and cast all day without fatigue. great reel , learn how to use it, as you adjust brake hold pole straight out in front of you and let lure drop very slowly to the ground , use the correct line and lure weight to get this result, you will not have backlashes. Light and casts a mile.LOVE the sound of the spool! Very good real, for a very good price. After fishing with this reel for a few weeks, all I can say is Wow! Super light, smooth and cast the lightest of baits with ease with out backlash.